I love to discover new plants growing around my yard and neighborhood. But no matter how interesting a plant looks, I always identify it before touching its leaves. Some of the most attractive plants can be poisonous to the taste or touch. 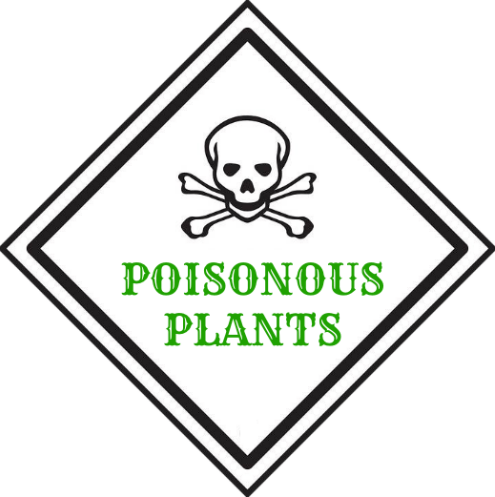 This week, I’m shedding some light on the characteristics of plants that are poisonous to humans, pets, or both. Water Hemlock. This plant bears a resemblance to artichokes, wild parsnip, and sweet potatoes. Unfortunately, this has led to poisonings. Consuming water hemlock can cause a person’s nervous system to fail. Some symptoms of poisoning include seizures, rapid pulse, and convulsions. This poison is fast-acting, so it’s imperative to rush the person to the emergency room. Foxglove. Foxglove, sometimes referred to as “dead man’s bells,” contains digitalis, which can be deadly to humans who eat it. More specifically, it can cause heart failure. Symptoms experienced after ingesting foxglove may include irregular or slow heartbeat, dizziness, fainting, and blurred vision. Poison control should be called immediately if someone eats this plant. Rhubarb Leaves. You may have enjoyed the stems of rhubarb in a pie or other dessert, but its leaves are poisonous. The leaves contain oxalic acid, which can cause a person’s kidneys to fail. Symptoms experienced after ingesting rhubarb leaves can include a burning sensation in the throat and mouth as well as vomiting and difficulty breathing. Take the person to the ER immediately if you suspect that they have eaten rhubarb leaves. Buttercup. Though bright yellow buttercups are attractive to look at, they are poisonous. They have a sour taste, which usually stops people and animals from eating the entire plant. If buttercups are ingested, they can cause convulsions, nausea, and vomiting. Poison control should be called if someone eats this plant. Mistletoe. Every part of mistletoe is poisonous, including its white berries. Eating it can cause stomach pain, a slow heartbeat, and even hallucinations. Call poison control if someone ingests this plant. Daffodils. Daffodil bulbs contain lycorine and are poisonous to dogs and cats. If you think your dog or cat has swallowed or chewed on a daffodil bulb, watch for vomiting, labored breathing, drooling, and diarrhea. If you see these symptoms, take your pet to the vet right away. Lilies. Some types of lilies are poisonous to cats and dogs; day, tiger, Japanese and Asiatic lilies are some common examples. Ingesting these lilies can cause a pet’s kidneys to fail. Dogs or cats that have eaten poisonous lilies may paw at their mouth, drool, vomit, or experience diarrhea. Take your pet and the lily it ate to the vet right away. Lily of the Valley. Lily of the valley is poisonous to dogs and cats. It causes heart arrhythmia, vomiting, and diarrhea. Take the cat or dog to the vet if you suspect that it has consumed this plant. Tulips. Tulip bulbs are poisonous to dogs and cats. Eating them causes dogs and cats to vomit, drool, and experience irritated tissue around the mouth. Fortunately, vets have ways that they can treat a dog or cat poisoned by a tulip bulb. Wisteria. This plant is known for its lovely fragrance, but its seed pods are poisonous to dogs. Vomiting and diarrhea are signs that your dog has ingested wisteria. Take a quick trip to the vet if you think your dog has eaten wisteria. Poison Oak. The leaves, roots, and stem of this shrub contain urushiol. This oil causes severe rashes and weeping blisters when it touches a human’s skin. There are over-the-counter remedies for poison oak, but severe cases may require prescription cortisone. Poison Ivy. When a person touches poison ivy, the urushiol in the sap causes skin irritation. This common three-leaved plant causes a red, itchy rash, blisters, and inflammation about four to 24 hours after exposure. I once got poison ivy on my elbow by simply brushing against a small poison ivy plant growing near my doorstep. There are several over-the-counter remedies for a poison ivy rash. By the way, pets don’t get a rash from poison ivy. Poison Sumac. Poison sumac is a little tree with leaves that cause the same extreme rash, redness, and itching as poison ivy and poison oak. However, this plant is seen mostly near wetlands. Over-the-counter creams are effective at clearing up a rash caused by poison sumac. Poison Wood. This is an evergreen tree with sap containing urushiol. It causes a rash on skin exposed to the sap. It’s important to wash the sap off with soap and water. Over-the-counter remedies are an appropriate choice to relieve the rash. Stinging Nettle. Touching these plants can cause burning and itching due to its tiny hairs working their way under the skin. A cool compress and over-the-counter remedies can provide relief from the burning rash and/or blisters.